What’s in a name? For me, I like the musicality of Ken-dell Mar-vell, with added inflection on the dell & vel. I'm probably wrong, but its a great name. Lowdown & Lonesome is KM’s debut album and is released through Snakefarm Records today, May 18th. Says KM ‘I’m really looking forward to the release of my debut record. It was produced by Keith Gattis, and I refer to it as ZZ Top meets Merle Haggard’, and THAT is a damn good description of where to start. He has a pretty incredible back story – he moved from his native Illinois to Music City in 1998 intent on pursuing a music career. On his first day working in the city, he wrote ‘Right Where I need To Be’ - a huge Top 5 hit for country music singer Gary Allan. Putting his dreams of being an artiste on the back-burner, he continued to build his career and reputation, penning hits for and with famed artists such as George Strait, Jake Owen, Blake Shelton (U.S., The Voice), and Chris Stapleton. Now, some 20 years down the line, Marvel is thriving as a singer songwriter in his own right. He hosts his own monthly show in Nashville, and is one of the hottest tickets in town, thanks to a wide range of guest appearances from the like of Alison Krauss, Foo Fighters, The Black Crowes and Brothers Osbourne. You don’t get that kind of help and support if you’re not very good! To be honest, if you are a fan of any of the aforementioned names, Nashville, Country Rock, and the likes of Johnny Cash, Chris Stapleton, Eric Church, Jason Aldean, Rayna James, Deacon Claybourne, and The Good ‘Ol Boys (I could keep going for some time), mixed with a great knack of story telling and instantly memorable songs then you need look no further than Kendell Marvell and ‘Lowdown & Lonesome’. Its a mixed bag of songs that range from what I’d call ‘proper old school country’ to more mainstream country rock and all the above with a hint of blues. Opening track and title track ‘Lowdown & Lonesome’ is a great country rock n roll song. Full stop. It draws on Johnny Cash (think ‘Man Comes Around’) to the heavier end of country such as Eric Church. Its a country check list of lyrics - ‘Fulsom’, ‘Walk The Line’, ‘Whiskey River’ etc. You could play a drinking game to the country metaphors listed here in this one song. ’Marvell’s vocals have a gritty and gravelly sound that just draws you in for the long haul. ‘Gypsy Woman’ is acoustical and just so achingly good. Especially with its little Hammond lilts, and has a warmth due to is really cool harmonies. ‘Heartache Off My Back’ just powers forward and just makes you want to get up out of your chair and dance! ‘Watch Your Heart’ showcases KM’s vocals, a slow burner where the first half shows off his lower register, then it soars on the latter half. There is a mid-section of songs that makes me sit up as they are co-written with Chris Stapleton amongst others. ‘Untangle My Mind’ with its honky-tonk piano transports me to ‘Bobs Country Bunker’ chock full of beer-swillers and whiskey drinkers. 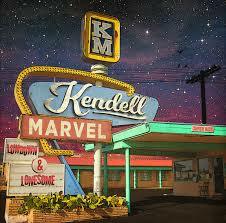 Kendell clearly has some friends in very high places – most of whom have turned out to play on this album, and he has used them to great effect. If you think county is a bit ‘samey’ and jaded, then look at Kendell, he is trying to break free of the chains. He is cut from the same cloth as some of the greats. Whilst he is no spring chicken, he has an even greater future ahead of him as a performer. There’s enough variation on offer here to keep a wide ranging country fan invested, both classic and modern country. I'm just pissed off that I only found out about him this week, just one week after he has toured the UK with Brothers Osborne. Dayum.